One of my favorite things to do in life is go out for ice cream. 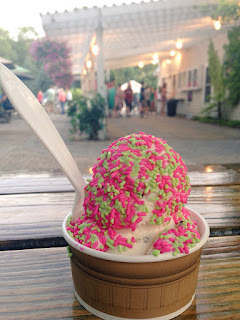 Last year the Cape Cod Times ranked the Top 10 ice cream places on the Cape, which made me decide to start making my own list. I didn’t get very far last year but my goal is to try and review as many as possible. I have enlisted the help of some of my friends and I can’t wait to share with you my favorites (and least favorite) ice cream places on Cape Cod. It’s National Ice Cream Day and time for the second stop on my Cape Cod Ice Cream Tour as I am searching to find anything that can top Somerset Creamery. Sweet Caroline’s Ice Cream may not compare but it is near the top of my list. My mom loves going there because they have Milky Way ice cream—her favorite! It’s only a short drive from my house and a midpoint between my house and the Dubovsky household so we make several trips there each summer. Lots of choices, pretty good ice cream. 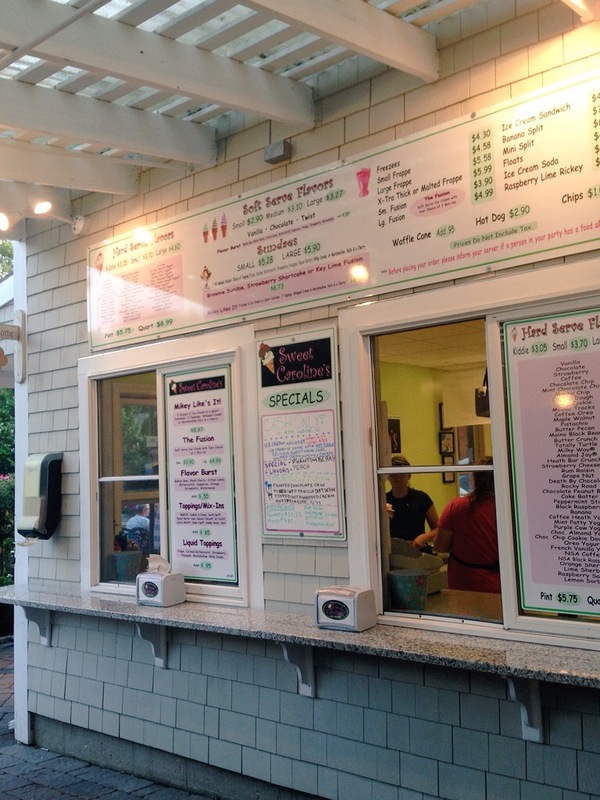 “Named in honor of our daughter, Caroline, who was turning “Sweet Sixteen” that year, our mission was and continues to be to provide delicious, premium ice cream at a fair price in a beautiful setting to the neighborhoods surrounding us in Forestdale, South Sandwich and beyond. Small Cookie Dough in a dish with rainbow sprinkles. Good ice cream, moderate amount of cookie dough chunks but still no Somerset Creamery. I like my ice cream a little bit creamier. Bonus points: The rainbow sprinkles are pink and lime green! Sweet Caroline’s offers a wide range of flavors of homemade ice cream. All the classics plus flavors: Maine Black Bear, Green Monster, Cake Batter, Death by Chocolate, Rocky Road, Milky Way (my mom’s favorite! ), and many more. They also have soft serve (they make fusions which are their version of Dairy Queen’s popular Blizzards), frozen yogurt, sherbet, and sorbet. The website mentions the smell of “freshly baked waffle cones” but I have never noticed. If I don’t see them making the cones or can’t smell fresh cones, I typically don’t order waffle cones. Have you tried one there? Do you like them? Are they fresh? I already mentioned earlier, I love the rainbow sprinkles! One negative. I don’t like places that don’t offer medium as a size option! For homemade ice cream they have kiddie, small, and large. Soft serve comes small, medium, and large. Decent size parking lot. A little narrow and can be hard to get out of your spot if it’s really crowded. 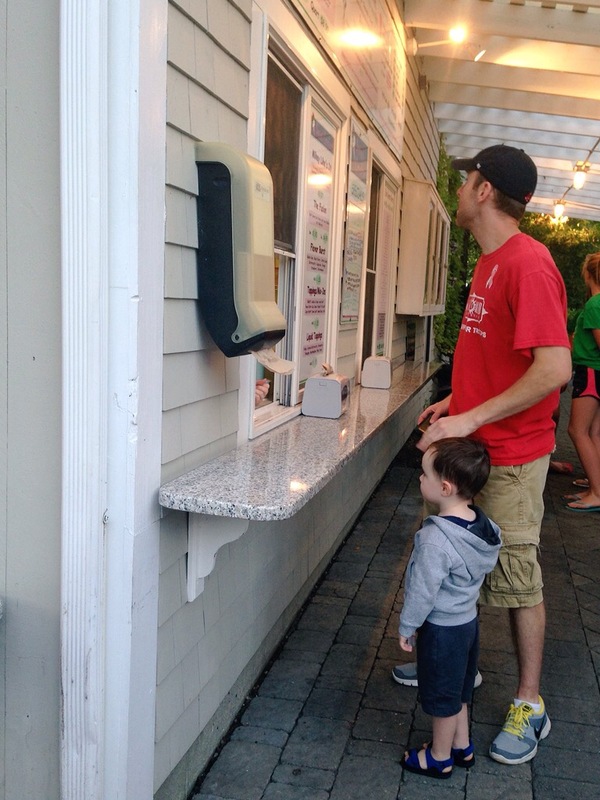 Like any ice cream place on Cape Cod, you can expect lines at their busy times (weekends after dinner). The line is a little unorganized and customers order at one window, pick up on the side. Often times more people waiting for their order than people waiting in line. Not sure it’s the best system but it’s been like that as long as I’ve been going there. Nice area for outdoor seating. Lots of picnic tables and benches with pretty landscaping. If you go with my (almost!) 3 year old friend Landon, expect to walk the “choo choo tracks” in the cobblestone! Run Jen Run gives Sweet Caroline's Ice Cream 4 out of 5 cones!